When Steve Jobs unveiled the first iMac, he shocked the tech community by jettisoning the 3.5″ floppy drive and Apple Desktop Bus (ADB) port in favor of new technologies like the Universal Serial Bus (USB). He was perfectly willing to kick to the curb technologies that had been cultivated at Apple, such as the little-understood GeoPort. Weren’t All Mac Serial Ports the Same? 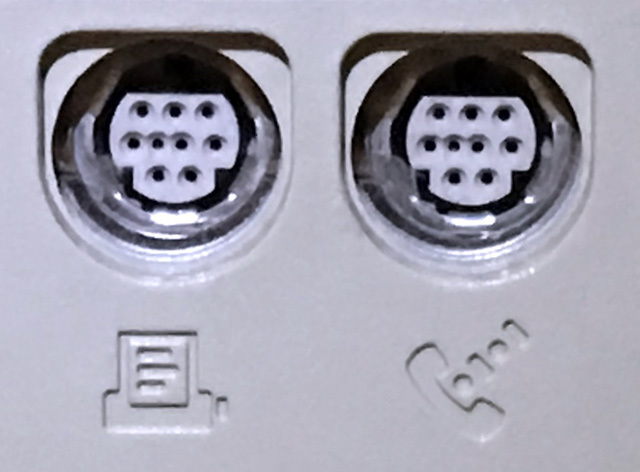 The pair of RS-422 serial ports (marked for a printer and modem, right) remained largely unchanged across Apple’s “platinum” beige systems, going all the way back to the venerable 1986 Apple IIGS and 1987 Mac SE and Mac II. Using the Mini DIN-8 form factor, the printer port became the de facto networking standard for early Macs, with AppleTalk performance limited to 230.4 kbps by the built-in clock chip. Though interchangeable with the printer port, the modem port typically ran slower when connecting to analog modems. That didn’t stop third parties (such as Centram, Dayna, and Farallon) from trying to reclock the serial ports up to threefold for faster performance through devices such as ethernet bridges. (AppleTalk allowed external clocking of the port up to 1 Mbps.) Often, the myriad extensions created stability problems and most of these tricks would be broken under Open Transport, a new Unix-derived networking protocol that was introduced with the Power Mac line in 1994. Can you spot the extra pin in these Mini DIN-9 GeoPorts? The GeoPort was introduced with some fanfare with the Quadra 660AV and 840AV. These two “AV” models were equipped with AT&T digital signal processors (DSPs) and a shiny new GeoPort where the classic modem port used to be. At first glance, the GeoPort looks just like the printer port next to it, but it’s actually a Mini DIN-9 with one additional pin that supplies 5 volts of power. Starting with the Power Macintosh series, the PowerPC processors were fast enough to replace both the printer and modem ports with GeoPorts. Even the Apple-designed Pippin console from Bandai was touted as having them. The GeoPort software moved some of the signal processing (such as compression and error correction) that was typically handled by the modem’s hardware* to the DSPs in the Quadra AV models — or to the CPUs themselves in PowerPC Macs. This, along with the power supplied by the extra pin, allowed the modem to be simplified into a glorified dongle, or “pod”, called the GeoPort Telecom Adapter that could initially operate at up to 9600 bps. This was similar in principle to the approach that Apple used with its PowerBook Express Modems — by offloading tasks onto the CPU, it could greatly simplify (and shrink) the modem card to fit within the confines of a PowerBook. This simplicity did come at a price: Use of the GeoPort Telecom Adapter would take up a sizeable chunk of system memory and processor cycles. If a slower CPU was overwhelmed, connections could be dropped. However, a key advantage was that GeoPort capabilities improved with software updates. With the adoption of the V.34 standard, the GeoPort Telecom Adapter’s connection speed was upgraded to 28.8 and then 33.6 kbps. Global Village came up with a novel approach to use the GeoPort (these are the clever folks who figured out how to run a modem using ADB). Its TelePort modems for GeoPort-equipped Macs utilized the 9th pin to draw power, but the modem contained all the needed DSPs in a nice self-contained package. The TelePort series could run even faster (up to the newer 56K standard) while using fewer system resources, all in a dongle that was smaller than Apple’s. 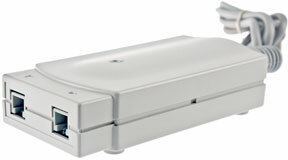 Though the GeoPort is theoretically capable of being externally clocked up to 2 Mbps, the fastest ISDN GeoPort Adapter only operated at up to 128 kbps. With the introduction of the G3 era, the GeoPort and all those other legacy ports became a thing of the past. However, that didn’t stop confused vintage Mac collectors from wondering why some serial cables fit and others don’t, sometimes bending or breaking the mysterious extra pin in the process. Some Power Macs also have the GeoPort pins integrated into their internal Comm Slot, which Global Village also took advantage of. 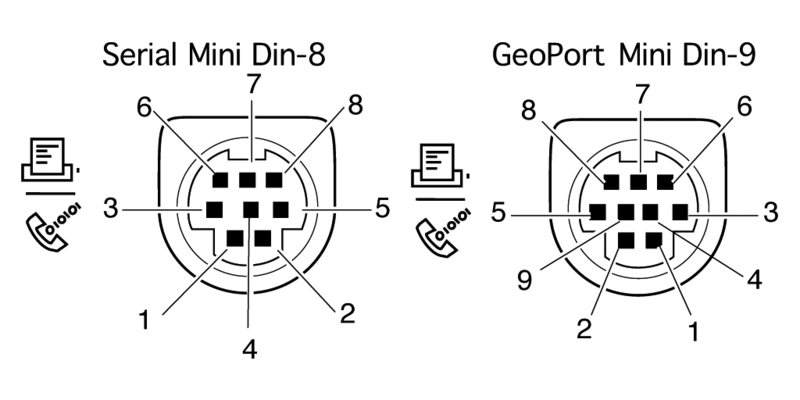 Diagram from Apple comparing Mini DIN-8 and Mini DIN-9. Here’s a quick way to check what you have: If the middle row of pins has 4 connectors, it’s a Mini DIN-9 GeoPort. If it has 3 connectors, it’s an older Mini DIN-8 serial port. 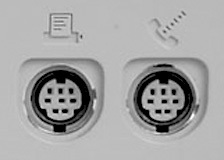 An older 8-pin serial device can be plugged in into a newer 9-pin GeoPort, but not the other way around. * The GeoPort Telecom Adapter is the Mac equivalent of a Winmodem or softmodem that eliminates some hardware to reduce the cost of a modem, but puts a lot more demands on the computer’s CPU.